Capitola Village—the heart of historic Capitola—has not changed much since it was originally founded by Frederick Augustus Hihn on June 18, 1874. Sure the buildings have changed, the entire nature of seasonal vacations have been altered, and the industrial aspects of the village are no more, but when it comes down to it, Capitola Village is still a resort town. And that is mostly because of the railroad. Samuel Alonzo Hall began allowing seasonal vacationers to stay on the beach outside his farm beginning in 1869. Hall leased the land from Hihn and accepted that the property was popular with the vacationing public. The land was pinched between the Soquel Landing Wharf, built a decade earlier by Hihn to serve as a shipping point for the logging mills of the Soquel Creek basin, and the California Sugar Beet Company mill up on the hill to the east. The name of the town, "Capitola", likely was after a heroine from a series of novels by E.D.E.N. Southworth. 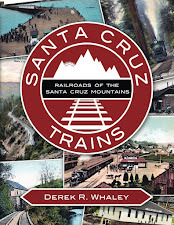 The opening of the Santa Cruz Railroad in 1876 accelerated the development of what would become Camp Capitola, though Hall wasn't pushed off of his land until 1879. Standard-gauging of the railroad in 1882 after its acquisition by the Southern Pacific prompted Hihn to formally recreate the property into a summer resort, subdividing the region into parcels for rent or purchase. Before he was done, Camp Capitola was already a popular tourist destination. 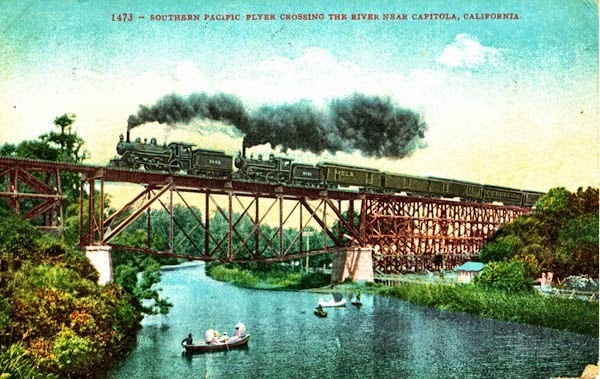 Postcard of Soquel Creek with the trestle overhead, c. 1900s. The initial tent city evolved into a mix of cottages, tent cottages, and more formal structures. The big change came in the 1890s when Hihn hired architect Edward L. Van Cleeck to design a 160-room hotel on the Esplanade. Other permanent structures soon followed. Hihn actively worked to push out industries from using the flat at the mouth of Soquel Creek, accepting the presence of the wharf but otherwise eliminating eye sores from the area. The railroad, on the other hand, was a welcomed industrial tool to the camp. 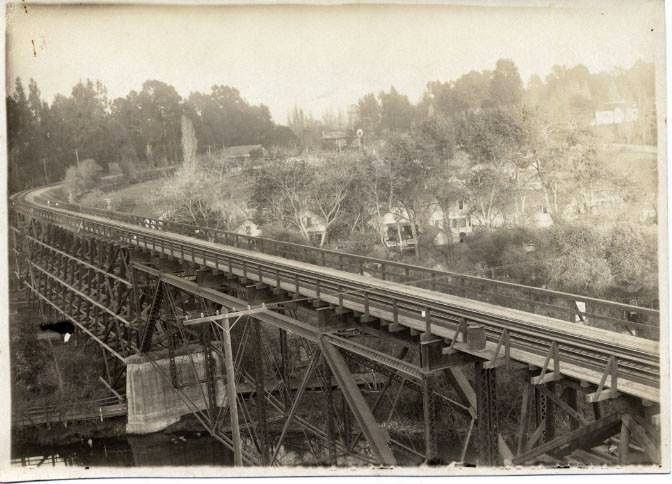 When graders first passed through Camp Capitola in 1874, they did so high above Soquel Creek where a massive trestle that included multiple imbedded truss spans over the creek and two access roads. The station for the community, therefore, was high up on the grade rather than near the creek. 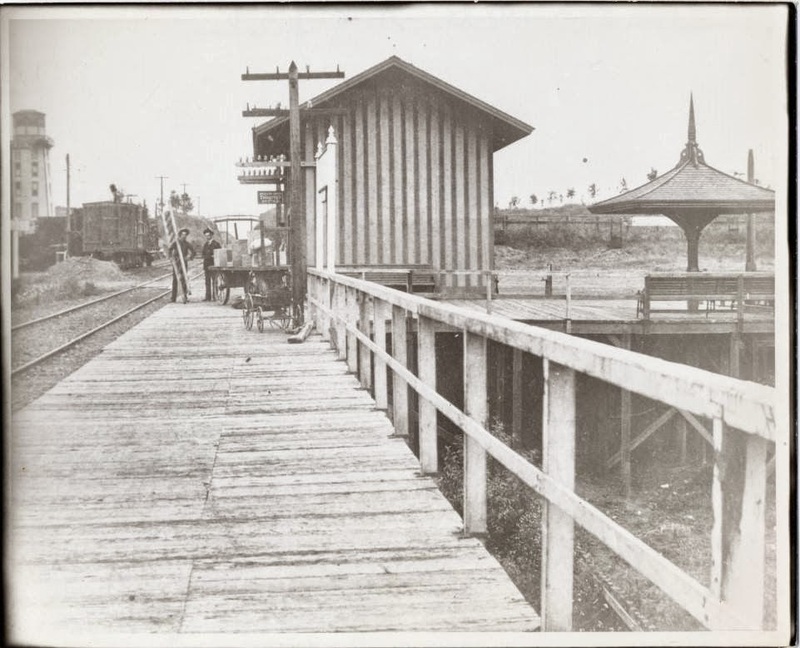 Nonetheless, the first depot for Camp Capitola was constructed in 1876 under the name "Soquel", just beyond the western end of the trestle alongside what is now Cliff Drive. Vacationers would either walk down the road and across the creek or take a buggy to the resort. The structure was a square box built on stilts with few amenities. The trestle was replaced in 1886 with a sturdier structure able to withstand the weight of standard-gauged trains. Three years earlier, the depot was moved to the east bank of the river along what became Park Avenue, placed on the north side of the tracks so that passengers would no longer have to cross the creek to get to the Camp. Just after the turn of the century, Hihn petitioned the railroad to replace the depot with a new and more decorative structure. In the process, he also had them move it across the street to 250 Monterey Avenue. 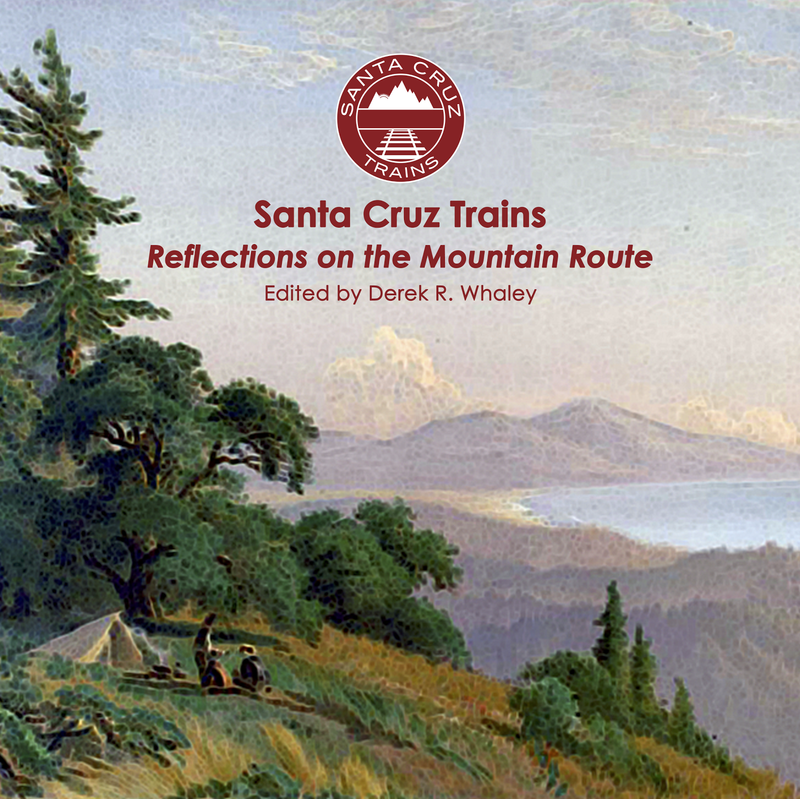 This new station matched the style of many of the others in Santa Cruz County, with a Victorian-style bay window acting as the ticket booth, and a covered porch to shelter waiting passengers from the elements. The new station included a 1,580-foot-long siding that ran from the end of the trestle eastward. This siding was still in place at the beginning of World War II. The station sat on the south side of the tracks and is still there today, though it has been rotated 90˚ and turned into a private residence. The original station owner sold it to Lucinda Savoy, who passed it on to Bea and Harry Schultz, who sold it to Cecil Carnes. 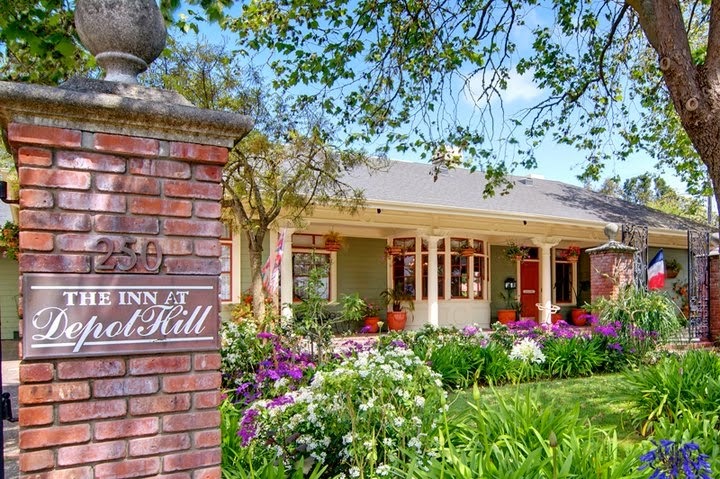 It finally was sold to Dan Floyd and Suzanne Lankes in 1990 after which they converted it into The Inn at Depot Hill. This is one of the only surviving stations in Santa Cruz County and the only one that is opened to the public. The town thrived into the 1910s when Hihn's daughter sold the entire town, now called Capitola-By-The-Sea, to Henry Allen Rispin, who turned the village into a Spanish Revival-themed resort. His conversion did not entirely succeed resulting in the present mix of Victorian-, Spanish-, and other-themed structures present in Capitola Village today. The advent of the automobile in the late 1910s and the completion of the Glenwood Highway to San José meant that people were no longer visiting Capitola-By-The-Sea for month-long visits, but rather stopping in for only a few days. The tent cities disappeared and auto camps replaced them. To maintain patronage, events were held constantly through the summer while such facilities as the 300-seat Capitola Theater, beach-side concessions and rides, and a skating rink helped draw new customers. In addition, the old bathhouse was restored and upgraded after ocean flooding undermined its foundation in 1932. The county take-over of Capitola-By-The-Sea, generally known simply as Capitola by the 1930s, began as early as the end of the 1920s when Rispin faced financial and political difficulties. The Great Depression and numerous fires that destroyed large parts of the community forced the county to intercede and take control of the bulk of the village. Regular railroad passenger traffic ended in 1938 due to poor sales, though excursion trains sometimes stopped in the summer. All remaining passenger trains ended in 1941 and when the Suntan Specials resumed in 1947. For three years, the trains stopped at Capitola village on its way to the Boardwalk in Santa Cruz, but in 1950 service was abandoned to Capitola. The station was formally abandoned in January 1956 and the structure was given to the last station agency for $1. The era of railroad traffic to the town was done. The Inn at Depot Hill, heavily upgraded and modified since its last use as a railroad station sixty-five years ago. Capitola grew increasingly into a permanent town of established residences, though the village always attracted modest tourist populations because of the beach and the seaside environment. The City of Capitola was incorporated on January 4, 1949, but the center of the town had migrated to the western bluff above Soquel Creek. The large trestle over Soquel Creek stills stands and is now owned by Santa Cruz County for its Santa Cruz & Monterey Bay Railway, but repairs must be made on the trestle before it can be used for regular passenger service. Once completed, it is likely that Capitola will once again have passenger service, though the depot would likely be placed closer to 41st Avenue to the west than its historic location to the east. Carolyn Swift, Capitola Historical Context Statement (Capitola, CA: City of Capitola Community Development Department, 2004). last run and there was no stopping then either. Another fascinating article! Thank you! Yeah, train service via the Suntan Special apparently continued for a few years after World War II. It surprised me too. I was even more surprised to discover how long the Southern Pacific held on to the depot after service ended. Hi Derek. You might see if you can get Carolyn to read this over for you. She might have some corrections and updates. How tall is the trestle. When I was in third grade I couldn't make friends, so I stopped riding the school bus and used to walk across the trestle to go to grade school. I loved walking that route. That would be the Polar Express train. It is running on weekends throughout this winter (as well as Fridays and a few select weekdays). They have up to four runs an evening and the train runs between the Boardwalk and Capitola Village. Hello, I’ve always wanted to walk that trestle. So I did on a pre-Mother’s Day scouting trip on Sunday. My son is coming to celebrate with me so I’ve planned an adventure picnic - Gayles then up to the trestle. I thought I should make sure there will be no train running......Thanks!